Generously coat all 4 sides of Ahi block with Nori Komi furikake. Add 2-3 teaspoons of oil in a small saute pan over medium-high heat. Once the pan is hot, add the Ahi block to the pan and sear for about 30-45 seconds per side or until desired doneness is reached. 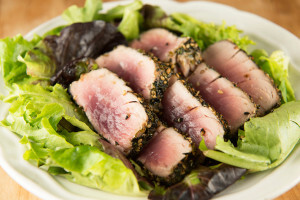 Once Ahi is done, remove from pan and let cool for several minutes. Slice into ½ inch thick pieces and serve on salad. Top with miso or sesame dressing. Mahalo for lunch! I had the yakisoba bento and my mom a mini bento with butterfish! Love your store! Love the bentos! So ono!